I think this is a Griffon vulture; correct me if I'm wrong. Forgot to burn a bit his highlights; his 'shoulder'. For Manyee: I don't know if it's an alpha male or not:-) nevertheless I dedicate this one to you after showing me your alpha male; and I refuse to go in competition with the latter:-). Good weekend for the TrekNature community as well! The Griffon Vulture, Gyps fulvus is an Old World vulture in the family Accipitridae, which also includes eagles, kites, buzzards and hawks. It breeds on crags in mountains in southern Europe, north Africa, and Asia, laying one egg. Griffons may form loose colonies. The population is mostly resident. Griffon Vultures have been re-introduced successfully into the Massif Central in France. In Italy, the species survived only in Sardinia, but was re-introduced in a few other areas of the peninsula. As a result, several specimens been spotted again in August 2006 on the Gran Sasso massif (central Italy). A colony of Griffon vultures can also be found near the town of Beli on the island of Cres in Croatia. 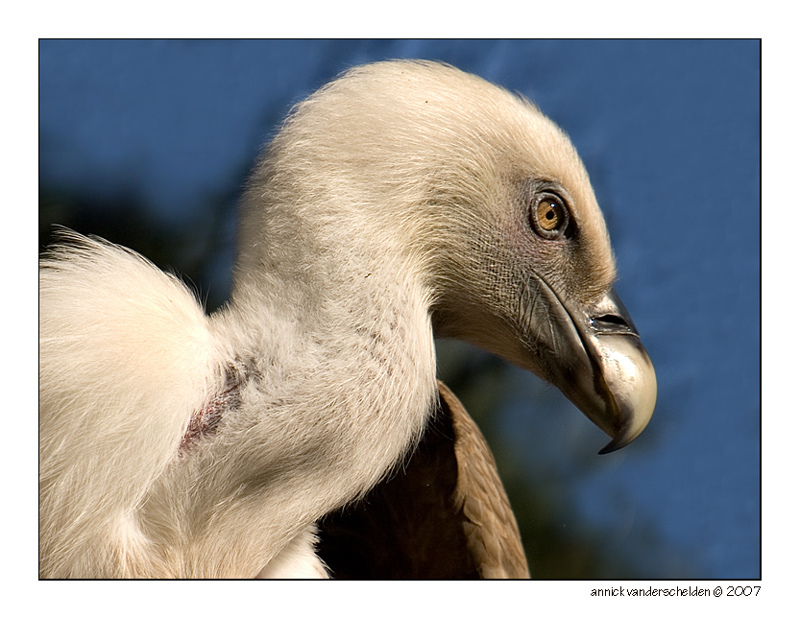 Because of this, the Griffon vulture has the most subspecies of any vulture. What a nice POV and terrific reproduction of plumage of this cute bird. I also like your hold composition and cropping as well as the impressive BG which underlines the beauty of the bird perfectly. Very interesting work. My best regards and TFS. No es el buitre un ave por la que sienta mucha "simpat�a" pero este que has presentado aqu� tiene una pinta realmente estupenda: perfectos detalles, con esa luz preciosa y ese BG que hace resaltar este "retrato". Un trabajo de mucha calidad. Beautifully captured, a delightful image - good detail and exposure on the whites. Exceptional details in this beautiful closeup the eye is superb, thanks Annick. Great angle for this profile. A very dignified bearing. Stunning details, especially around the eye. The eye is sooo bright. OE on the shoulder notwithstanding, I think you handled the exposure very well. Lovely catch.Details,POV,BG,expression on face and composition are excellent. This is an EXCELLENT portrait. The texture of its feathers is just amazing; they seem so soft! This lightning, POV, composition, exposure and this blue BG are beautiful! I love the light in its eye and you managed very well with this pale color. This is very well done, congratulations! This is really a splendid capture! Also the pose of the bird and your POV here are exceptional and the warm light does wonders, too. Very good sharp details and a great DOF maangement, as well. Cheers, TFS and a great weekend! Tr�s belle photo! Le point de vue, la profondeur de champs, l'exposition, la composition, la nettet� sont tous excellent! Le contraste que fait le fond bleu avec le sujet mais bien en �vidence ce dernier. J'adore vraiment cette photo.